Welcome! Troop 77 is Switzerland's oldest existing BSA Troops, in fact, we were the first Boy Scout Troop in Geneva! Troop 77 has been an active member of the Community in Geneva since at least 1969. For over 40 years, we have been preparing youth in Geneva to make ethical and moral choices over their lifetimes by instilling in them the values of the Scout Oath and Law through the experiences of camping, hiking, teamwork, and community service. We are part of the Transatlantic Council (TAC) and we are chartered by the Church of Emmanuel in Geneva. Troop 77 meets Tuesday evenings at 7:30 alternating months between La Grande Boissiere Campus and College du Leman. Troop 77 is a BOY-led Troop! Sir Robert Baden-Powell, founder of the World Scout Movement, once said that a Scoutmaster should "never do anything a boy cannot do." This is a statement that we take very seriously. Our entire program is run with Baden-Powell's admonition in mind! Our Scouts plan and execute the program with only guidance from adults. Troop 77 features monthly campouts and several "high-adventure" activities such as multiple-day canoe and backpacking trips. We are also active in the community! The summer months have been keeping us busy! Several of our Scouts & Scouters attended Summer Camp 2014 in the Swiss Alps. Please feel free to explore our site and learn more about our program. Click on the Recent Events tab for our latest scouting activities. 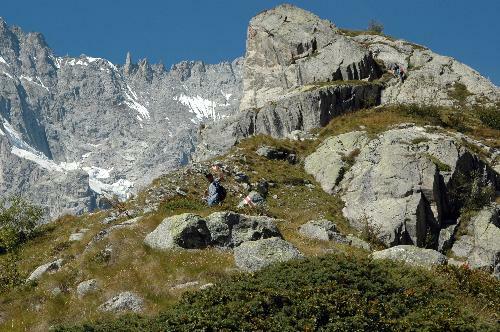 Pictured: Members of Troop 77 hiking in Val Ferret, Switzerland. Members of Troop 77 hiking back from International Scout Center, Kandersteg, Switzerland.